Art smiled as I saw Van Gogh on the streets, discovered Sixto Rodriguez’s music, felt The Wall (Pink Floyd. ), read Asimov’s The Last Question and continue reading E.H. Gombrich’s The Story of Art as well as Richard Kalvar’s Earthlings, bought during a week in Paris. Best film watched in 2013: Wim Wenders’ Wings of Desire. Astronomical Events, two of them: The Chelyabinsk meteor and learning how Erastothenes measured the circumference of the earth over two thousand years ago through Carl Sagan’s Cosmos series (Video.). 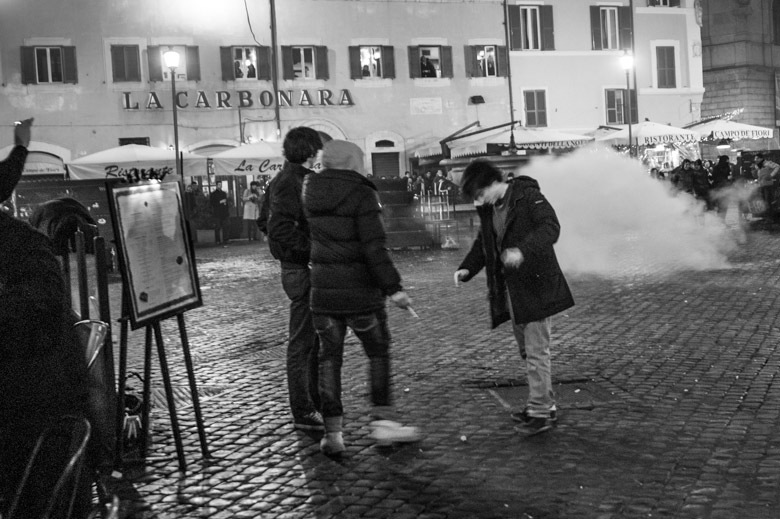 About one year ago in the second minute of 1 January 2013 in Campo de’ Fiori, Rome (not my best photograph of 2013). In 2014: Read more fiction, stay curious, do real work, and don’t forget life is once, forever.